Trying these tonight!I am in LOVE with my grandma’s homemade tortillas! She doesn’t use lard or any type of grease, but she does use white flour. Hers aren’t high in fat either but I still want to try to make this wheat version. I am also going to use olive oil in the mix! Amanda I didn’t notice anywhere a mention of how many calories are in this item. Is it half of what store bought tortillas contain? Can you give me a fairly accurate idea of calorie count. 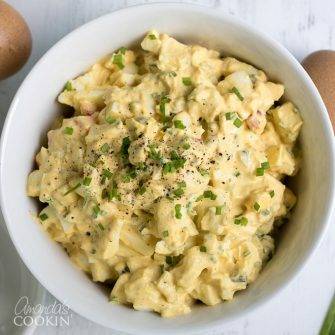 I substituted chickpea flour instead of wheat flour – great wrap!! Some people us cut-outs for a circle – like a lid. Any tips on how to roll them into actual circles? Mine always end up odd shaped! I actually like the less than perfect circles :) I call them rustic! It is much easier to make them by hand rather than rolling them out, also much quicker. This sounds so good, funny thing is that I bought a press years ago and have yet to use it. No excuses now that I have a real easy recipe. Now if anyone could help me with one thing, how to cook lengua. I have tried cooking in the oven like a roast and I have boiled the lengua, however the meat comes out mushy. I have tried increasing/decreasing cooking times… No luck. I would really like to bbq or smoke a lengua… Any help is greatly appreciated! I’m afraid i can’t help you with lengua, I have never made that, let alone heard of it. Have you tried googling for recipes and tips? Yes, i have googled lengua (cow tongue). And i have cooked it probably 10 to 15 times, but im doing something wrong so i thought i would try asking on chat rooms and boards. It doesn’t turn out bad, im just trying to improve on my techniques. Im also wanting to try smoking or bbq’ing the lengua… I need to find an old school, Mexican cook, or solemnes great grandma willing ROM,share family recipe secrets .. I made this last night and boy was it easy! The only thing I didn’t like was that it made 18 “small” tortillas. I just couldn’t get them to roll out any bigger than 5-6″. So I just doubled them up and made bigger ones. I made sandwiches with them by just making them like a “taco” and not trying to “roll” anything up. YUM!!! It is time consuming but if I got ahold of a tortilla press, it may speed things up a bit? Thanks for the recipe!!! I'm sorry I don't have the cal/fat count on these. I hope you try them! Does anyone know what the calorie count is and fat count? I mean these beat rice cakes any time. I guess If I made them thin enough. cut the calories!! Has anyone tried Olive Oil that would add flavor Thanks for the recipe!! I wish I had good torts here in Spain!! These look awesome Amanda. But as a few have pointed out, these are what we call chappatis/roti bread in india, the most common bread, naan is actually something we only eat at restaurants. It's this roti that we eat with all Indian preparations! I am from India. 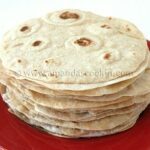 Your Low Fat Homemade Flour Tortillas are actually the Chapatti/ Roti/Phulka as we call it in India. This what we eat daily with veggies or curry. Our recipe similar to yours minus the all purpose flour and baking powder. You can also use multi grain flour to make it more nutritious. The warm water used to knead the flour will make the chapatti's remain softer for longer time. Chapathis are low fat food.Its verry healdhey food to our body.So, thanks for sharing this post.